Do International Adoptions Require U.S. Visas for Children? On the journey to adopting internationally, there are many steps. Beginning with your home study, assembling your dossier, and filing an I-800 or I-600, each form brings you one step closer to becoming a family. The last step to bring your newly adopted child home; is to receive a visa for your child so they may enter the United States. Upon completing the adoption process, the adoptive parents will file for an immigration visa on behalf of their child, with the U.S. Embassy or Consulate in the country where the adopted child lives. Often times this requires traveling, from your adopted child’s province to the city where the Embassy or Consulate is based. There are typically two types of visas issued for internationally adopted children: IH-3 and IH-4, for children adopted from Hague Convention countries, and IR-3 and IR-4, for children adopted from non-Hague Convention countries. The IH-3/IR-3 classifications are for the adoptions completed within the child’s country of origin. In this case, upon entering the United States, the child automatically becomes a U.S. citizen. The IH-4/IR-4 classifications are for the adoptions completed in the United States. In this case, upon entering the United States, the child will be considered a permanent resident. The child will become a U.S. citizen once the adoption finalizes in the United States. 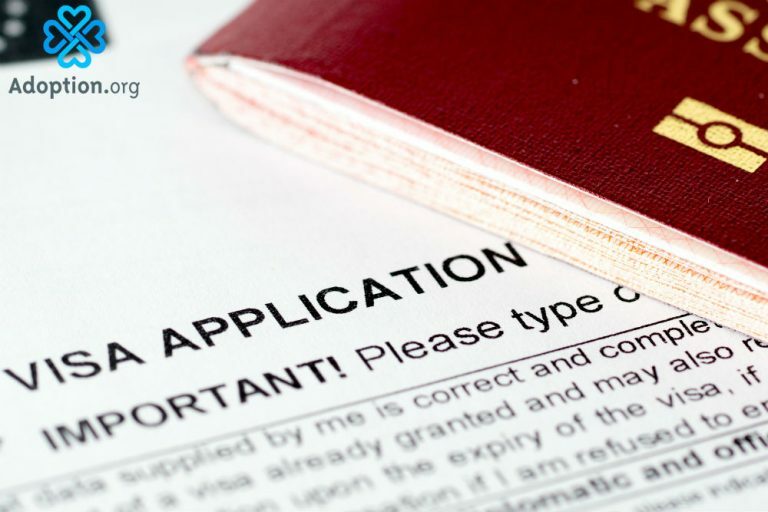 During the visa process, the Embassy or Consulate will ask for a variety of documents including your new child’s passport, a written court order for the adoption, the child’s birth certificate, the child’s medical report, vaccination records, and if you adopted from a Hague Convention country, Article 23. Passport size photos of your child as well as country-specific adoption documents may be required. The consulate will conduct a short interview with the adoptive parents and child, and after the consulate will issue a decision. Typically, parents can pick up their child’s visa 2-3 business days later, but timeliness will vary from country to country, so be sure to consult your adoption agency. It’s important to remember that the final decision to enter the United States lies with the USCIS port of entry—typically passport control at the airport where you first land in the United States. Be sure to keep all important documents in your possession so your entry in the United States can be as smooth as possible. Still curious how the visa process will work for your family? Visit U.S. Citizenship and Immigration Services for more country-specific information. Jennifer S. Jones is a writer, performer, storyteller and arts educator. She holds an MFA (Playwriting) from NYU Tisch. She has written numerous plays including the internationally renowned, award-winning Appearance of Life. Her amazing transracial transcultural family was created through adoption from China and India. She is passionate about the adoption community and talks about the ins and outs, ups and downs, joys and “is this really us? !” whenever she can. She writes about her experiences at www.letterstojack.com.